The Department of Trade and Industry (DTI) is all set to unify the different sectors of the Philippine creative industry to nurture the industry to become a key driver for economic growth. Through its programs, DTI will promote the lucrative economic potential of the Philippines’ creative industries, creative clusters, and creative cities as a viable strategy for sustainable and inclusive development in the region. In 2014, the creative industry employed 14.4 percent of the country’s total labor force and contributed to P661 billion pesos, 7.34 percent of the country’s total GDP. Worldwide, the creative industry is valued at $2,250 billion. “As host of the 30th ASEAN Summit, we are in a prime position to push for the ASEAN initiative to foster creative economies and develop at least one creative city in the country,” said Trade and Investments Promotion Group (TIPG) Undersecretary Nora K. Terrado. 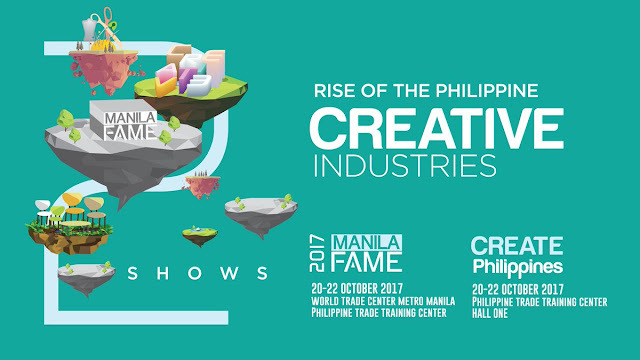 DTI, through the Center for International Trade Expositions and Missions, is set to take advantage of the multi-billion industry through CREATE Philippines, the Philippines’ first international creative industry trade show. Featuring the best and the brightest in the Philippine creative scene, CREATE Philippines will serve as a development platform where artists, professionals, content creators, and developers can showcase their work and vie for business opportunities. The trade show will serve as an idea hub, pitching event, masterclass venue, and trade fair focusing on fast-growing creative sectors, namely: Visual Arts & Graphic Design, Communication Design, Advertising Content & Production, Film & Animation, Digital Games & Apps, and Music & Performing Arts. CREATE Philippines will run concurrent to the 66th edition of Manila FAME, the country’s premier lifestyle, and design event, on October 20-22 at the Philippine Trade and Training Center and HallONE, Pasay City. “[CREATE Philippines] will streamline the nation’s long-term goal of developing creative cities in the Philippines under the UNESCO creative cities network. It will accelerate the roadmap for the development of the country’s creative industry as we introduce the Creative Economy Council of the Philippines (CECP) as the new generation of industry champions,” Terrado said. CECP and the Board of Investments (BOI) are working together to put the Philippines in the top five creative economies in Asia Pacific alongside South Korea, Japan, China, and India by 2030. Creative industries, such as animation and game development, fall under the fast-growing information technology and business process management (IT-BPM) industry, which the government pins its high hopes to due to its huge financial contribution to the Philippines’ economy. The IT-BPM industry generated more than $25 billion in revenue in 2016, and is expecting to double that with $40 billion and provide 1.8 million additional jobs by 2022. BOI has included creative industries in its 2017 Investment Priorities Plan, particularly in services that involve original content production such as animation, game and software development, and engineering design, among others. CECP, a think tank strategy group comprised of members from several creative industries, is serving as the government’s “single point of communication” with private creative sectors.